“A great sign appeared in heaven: a woman clothed with the sun, with the moon under her feet and a crown of twelve stars on her head” (Revelation 12:1). “This maternity of Mary in the order of grace began with the consent which she gave in faith at the Annunciation and which she sustained without wavering beneath the cross, and lasts until the eternal fulfillment of all the elect. Taken up to heaven she did not lay aside this salvific duty, but by her constant intercession continues to bring us the gifts of eternal salvation. By her maternal charity, she cares for the brethren of her Son, who still journey on earth surrounded by dangers and difficulties, until they are led into the happiness of their true home” (Lumen Gentium, 62, Documents of Vatican II). “Hence the revered Mother of God, from all eternity joined in a hidden way with Jesus Christ in one and the same decree of predestination, immaculate in her conception, a most perfect virgin in her divine motherhood, the noble associate of the divine Redeemer who has won a complete triumph over sin and its consequences, finally obtained, as the supreme culmination of her privileges, that she should be preserved free from the corruption of the tomb and that, like her own Son, having overcome death, she might be taken up body and soul to the glory of heaven where, as Queen, she sits in splendor at the right hand of her Son, the immortal King of the Ages” (40). “The mutual relationship between the mystery of the Church and Mary appears clearly in the “great portent” described in the Book of Revelation: ‘A great portent appeared in heaven, a woman clothed with the sun, with the moon under her feet, and on her head a crown of twelve stars’ (12:1). In this sign the Church recognizes an image of her own mystery: present in history, she knows that she transcends history, inasmuch as she constitutes on earth the ‘seed and beginning’ of the Kingdom of God. The Church sees this mystery fulfilled in complete and exemplary fashion in Mary. She is the woman of glory in whom God’s plan could be carried out with supreme perfection” (Redemptoris Mater, 103; see also no. 47 – “And by her ecclesial identification as the “woman clothed with the sun” (Rev. 12:1), it can be said that ‘in the Most Holy Virgin the Church has already reached that perfection whereby she exists without spot or wrinkle.’”). “A great sign,” thus the Apostle St. John describes a vision divinely sent him, appears in the heavens: “A woman clothed with the sun, and with the moon under her feet and a crown of twelve stars upon her head.” Everyone knows that this woman signified the Virgin Mary, the stainless one who brought forth our head…John therefore saw the Most Holy Mother of God already in eternal happiness, yet travailing in a mysterious childbirth. What birth was it? Surely it was the birth of us who, still in exile, are yet to be generated to the perfect charity of God, and to eternal happiness. And the birth pains show the love and desire with which the Virgin from heaven above watches over us, and strives with unwearying prayer to bring about the fulfillment of the number of the elect. CONCLUSION: The dogma of Mary’s Assumption into Heaven stands on a strong foundation, Biblically, theologically and historically. 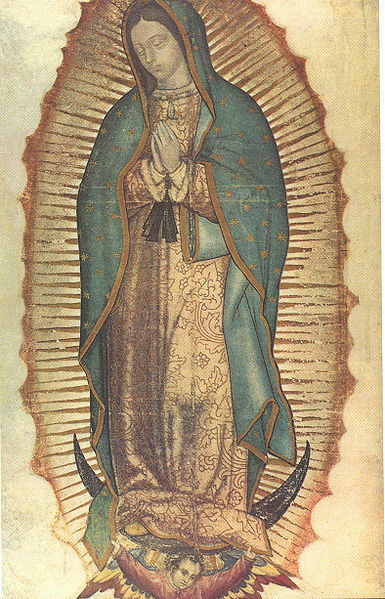 For faithful Catholics it has been proved over and over again in approved apparitions such as Lourdes and Fatima, and, of course, Guadalupe, imaged above. References: The Truth About Mary, Volume II, by Robert Payesko; “Assumptions About Mary” by T.L. Frazier, This Rock, Volume 3, Number 5 & 6May-June 1992; Ignatius Catholic Study Bible; and an EWTN note on Rev. 12:1 by Fr. John Echert containing the quote from Pope Pius X.